Eldonia ludwigi is a good example of a problematic fossil organism. 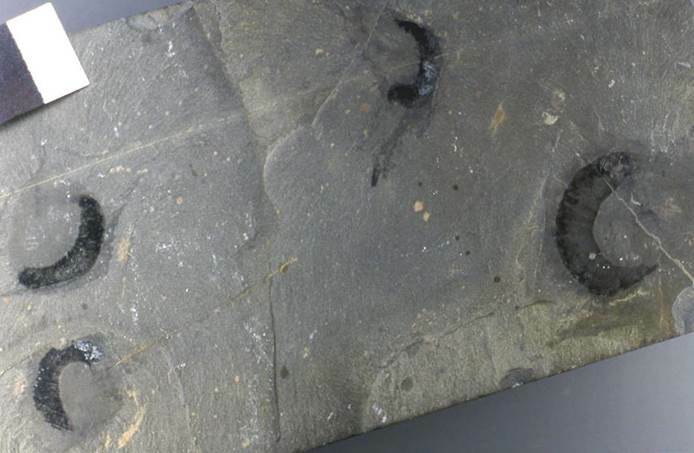 Eldonia and Eldonia-like fossils are known from scattered localities around the world, but they are concentrated in Cambrian soft-bodied fossil deposits such as the British Columbia’s Burgess Shale (see introductory comments) and China’s Chengjiang deposit. The slab shown below has four specimens of Eldonia ludwigi Walcott, 1911. Eldonia had a nonmineralized, medusiform, disc-shaped body with radiating structures, apparent tentacular organs, and a coiled gut (usually very dark-colored). Early interpretations held that Eldonia was a holothurian (a sea cucumber). This view may be correct, but Eldonia and Eldonia-like organisms are often now considered to be lophophorates (Superphylum Lophophorata, which includes several familiar groups: brachiopods, bryozoans, entoprocts, and phoronids). Who knows? The Eldonia ludwigi slab shown below comes from the Burgess Shale Lagerstätte of southeastern British Columbia, Canada. These organisms are entirely nonmineralizing, and many details of their soft-part anatomy are readily discerned. Eldonia ludwigi Walcott, 1911 (centimeter scale) from the Burgess Shale (Middle Cambrian) above Field, British Columbia, southwestern Canada. 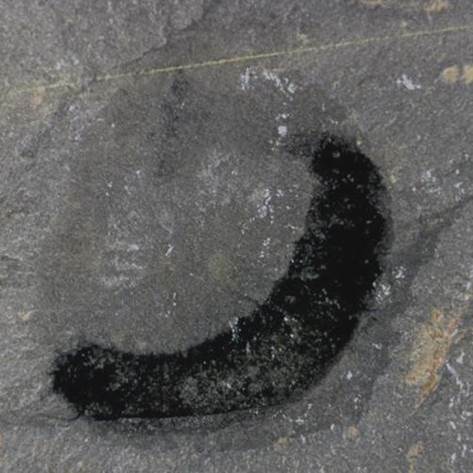 Eldonia ludwigi Walcott, 1911 (diameter ~3 to ~3.5 cm across) from the Burgess Shale (Middle Cambrian) above Field, British Columbia, southwestern Canada. 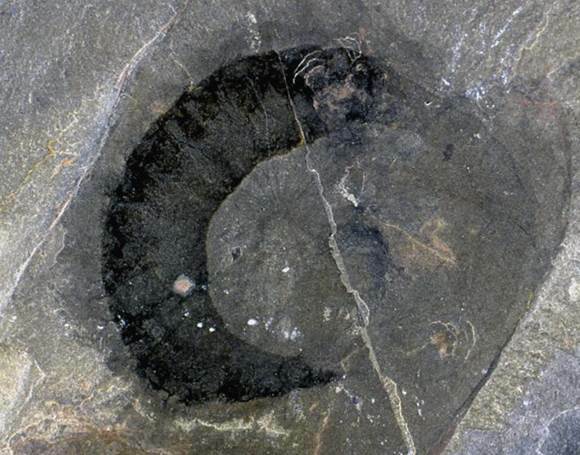 Eldonia ludwigi Walcott, 1911 (diameter ~1.8 cm across) from the Burgess Shale (Middle Cambrian) above Field, British Columbia, southwestern Canada.